Description: Small 127mm Mak-Newt that ships with a 6x30 finder. For the last 10 months I have been evaluating thr MN56 MakNewt. The images provided by its 5 inch aperture is amazing. I have owned a 12 1/2 inch Cave and C8 and have found that the optical quality of the MN56 is on a higher level. 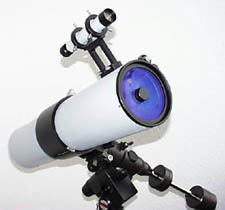 It is a very solid telescope with heavier construction than is typical. I have it handle magnification as high as 475X with a 5mm Radian and 5X powermate. The images at this level where remarkably crisp. My CG5 mount carries this scope very well. The only poor feature was the finder. I replaced it with a Vixen 7X50. I often hear that this telescope is refractor-like. I completely agree. I recently compared to a Meade 4 inch SCT and that the contrast was in a different league. I purchased the MN56 from ITE. It arrived with its test evaluation. The cost of the OTA including the baffled dew cap was $875.